Silver and frosty to a warm winter glow, there are many ways to decorate a Christmas tree. But whether you reach for the red tinsel or the white this year, there’s one element in your box of Christmas magic that always remains the same - the lights. They’re like an old faithful, coming out each Christmas having been stored for nye on a year up in the loft or a spare cupboard. Year on year, a ritual ensues, where the family get together with several metres of lights, spending half an hour untangling them all, before turning them on and finding out which bulbs have blown since last Christmas. If you really think about it, your Christmas tree lights are often the first decoration that you drape around the tree and the last element to be unwound once the celebrations are over. In a way, they signify the start, and the end, of your christmas festivities, and therefore deserve a little thought, care and consideration. Twinkly, still, chasing or completely multi-function, there are a huge range of christmas tree lights out there. And while some, like LED christmas tree lights, offer as much brightness as the Bethlehem Star, others emit a soft glow, creating a subtle light that mingles with the other sparkly things that weave in and out or dangle off the branches. 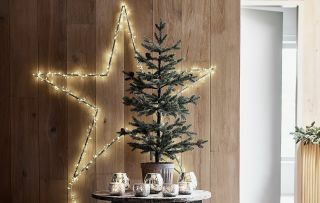 From heavy duty to complete novelties, we’ve compiled a list covering the best internal and external Christmas tree lights in the market right now. These are what we call the staple Christmas tree light. Warm white LED bulbs create a low level glow that emanates a subtle amount of Christmas magic. With 8 settings, you can choose to have the lights chasing each other around the tree or simply twinkling like little stars. What’s also good to know is these lights are renowned for their durability and a more than happy to sit outside and create a little winter wonderland in your garden too. The best warm Christmas tree lights around. With bright white bulbs, these are the loudest lights of the lot and will certainly bring heaps of sparkle to your Christmas tree this year. Alternatively, you can use these lights outside, where they won’t fail to dazzle Father Christmas and his reindeer to a stop as they marvel at their majesty. With an RRP of £39, they’re a little on the expensive side compared to many of the options out there, but for lights that pack a punch, they’re worth every penny. These stunning lights can transform an ordinary garden tree into a Christmassy feature with, quite literally, a flick of a switch. Whether they represent falling snow or twinkly icicles, their half a metre length and warm white bulbs can also create classy Christmas scenery along boulevards and shopfronts, in addition to a back garden. What’s great is that these lights can make a reappearance later on in the year as a warm background to summer BBQs and garden parties making them the perfect garden lights for all occasions. It’s not all about the 8ft Christmas tree that takes centre stage in your lounge. Many homes also feature little decorative trees to transform window sills and side tables into miniature festive masterpieces. And these compact tree lights will do the trick nicely. Elegant, sleek and with subtle wiring, the arty ones among us may even be able to work them nicely into a magical table decoration for Christmas dinner. These Christmas lights are best for small homes and apartments where the standards long string lights would appear overbearing. If, like many of us, you take Christmas as a time to become a temporary expert in festive landscape gardening, these berry lights with help you to create the mother of all magical grottoes in your front garden. Weave them in and out the bushes and trees and accompany them with some classic twinkling lights to create a charming winter wonderland walk up the garden path. It's rare to find good quality red Christmas lights that look gentle as opposed to a warning! These berry lights are perfect for creating a soft and inviting festive entranceway. Whether it’s adding a splash of colour to your festive garden display or the kids insisting the tree takes on a rainbow theme this Christmas, you can’t go wrong with these multi-coloured fairy lights. Robust enough to use externally, you could adorn your porch, window sills or garden fence with flashes of blue, green, yellow and red. With a generous 11m string of bulbs, these are the ideal lights for larger Christmas trees too. While fairy lights do a grand job of creating a myriad of Christmas connotations, the only way to improve on your improvisations of stars and snowflakes is investing in a set of these sparkly balls. From a distance, they actually look like freakishly large snowflakes. And, if you turn on the flashing function, they do a great job of becoming twinkly stars too. Hang them on your trees outside to create a subtly eye-catching Christmassy scene. These are a great alternative to classic Christmas string lights and from an interior design perspective, some would say a lot prettier!